Concerns are growing for the future of the country's best known carp fishing lake after most of its stock was wiped out by an unknown infection over the past couple of days. 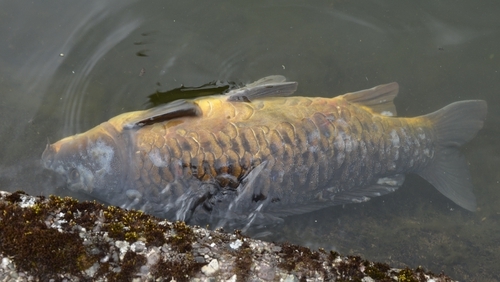 Over 400 dead carp - many up to 20 years old - have been removed by Inland Fisheries Ireland from The Lough, an urban lake in Cork city, since Saturday. Samples have been sent to the Marine Institute in Galway for testing. A bacterial or fungal infection is suspected, but after tests on sample fish the highly-contagious Koi Herpes Virus (KHV) has been ruled out. Further testing is continuing, but the cause of the deaths will not be known until later this week. The Lough, a freshwater lake, is the country's premier carp fishing ground. Local carp anglers raised concerns last Thursday when a number of large fish were spotted floating on the water, with many more covered in white blotches, and lethargic. Cork City Council, which manages The Lough, enlisted the help of Inland Fisheries Ireland which helped remove the dead fish over the past four days. Up to two trailer-loads, some 400 large fish, have been removed. Stephen Scully, of Cork City Council's Recreation and Sport Section, said it is a very serious matter. He said the council is waiting on the test results and will be guided by Inland Fisheries Ireland and the Marine Institute, on how to manage the infection. All fishing has now been suspended at The Lough. While a small number of young carp appear unaffected, local anglers say this will mean the end of coarse fishing at The Lough in the medium term. It is understood that restocking the lake could cost up to €100,000. Cork Carp Anglers Club member and marine biologist Bill Brazier said the fish kill is devastating. "It is Ireland's premium carp fishery, the quality and size of the fish are legendary. It is a huge loss to anglers, to the local economy and to The Lough itself. "The club has worked hard to maintain the fish stocks since it was re-stocked in 2001, and it is all gone in less than a matter of days," he added. Mr Brazier appealed to anglers, especially anyone who has fished The Lough in recent times, to disinfect all gear and equipment before fishing any other water.